As quoted by one of Goodsmile Racing’s own reporters, last night’s SUPER GT Sound 1 race in Okayama was… A strange one. The rainy weather was among the worst we’ve seen in any races to date, and resulted in many delays and accidents during the race. All of this eventually led to the early finish of the race at 31/82 laps completed, as there would have been no way to finish the race by 17:30, by regulation. Although Goodsmile Racing suffered some minor damage to their rear bumper after a collision by two other nearby cars, they were still able to race. But the early race finish resulted in GSR placing 9th overall. This ranking was bumped to 8th after a confirmed penalty on the #11 car (the GAINER TANAX GT-R). All drivers in the top 10 received half points for an incomplete race, resulting in GSR having a total of 1 and a half (1.5!) points. Quite an unusual race with an unusual score result. 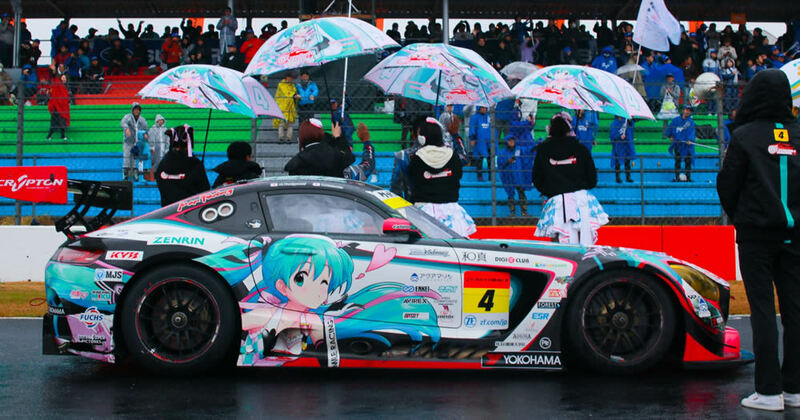 Here’s to hoping Round 2 in Fuji has better weather! That race will take place May 3rd~4th. Fight, GSR! A Hatsune Miku fan since December 2007, jrharbort joined MikuFan.com as the Head Writer in October 2011, and enjoys sharing news with other fans around the world. You can follow him on Twitter at @jrharbort! Find More Miku at HLJ! Hatsune Miku Goods @ Tokyo Otaku Mode! If Hatsune Miku goods and apparel are what you're after, our friends at Tokyo Otaku Mode have the latest and greatest. Click here to check them out! Hatsune Miku CDs, Blu-Rays, Games and Figures from CDJapan! CDJapan offers a wide range of CDs, DVDs, Blu-Rays, games and even figures to meet all your Vocaloid needs. Click here to check it out. Worldwide shipping available! Hatsune Miku: Magical Mirai 2017 on Blu-Ray! Get your hands on the Blu-Ray release of "Hatsune Miku: Magical Mirai 2017"! Blu-Ray features all performed songs in stunning full HD! Available in Regular and Limited editions!